Celsius X VI II, the pioneer brand in the development of amazing mechanical mobile phones, strikes again with a revolutionary new creation: LeDIX Furtif. With 700 mechanical parts clad in a body of stealth carbon fiber, framed with six golden wings and propelled by a tourbillon engine throbbing beneath a sapphire crystal breast-plate, LeDIX Furtif flies invisibly through the most exclusive hubs around the world. § creation of a unique time display mechanism featuring the world’s most off-centred flying tourbillon, protected by shock absorbers. § elimination of any magnetic effects on the mechanism and especially on the balance-spring so as to ensure the highest possible accuracy. § design of the most ergonomic interface serving to provide enhanced user friendliness by ensuring particularly intuitive use of the phone functions. 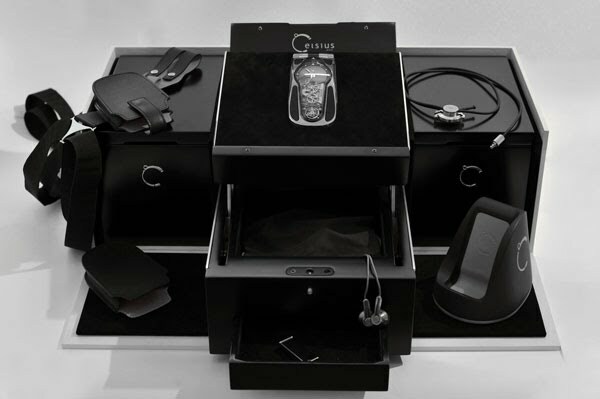 Significantly inspired by the stealth technology used in the most advanced aircraft, LeDIX Furtif is the very first mobile phone with a carbon fibre structure endowing it with sturdiness, lightness, a virile new total-black look, and an invisible shot of power and strength. No less than 35 engineers, watchmakers and other artisans are involved in creating this prestigious nomadic object. Boldly challenging existing norms, and evoking the hidden human desire for self-created rules and codes, LeDIX Furtif is destined to put the emotions back in communications, and to strike a blow for wild creativity. LeDIX Furtif will be presented as a world premiere at Baselworld 2012 in Hall 4.1, stand E07. It will be available as of May 2012 in three 8-piece limited editions featuring a choice of pink gold, platinum or black inserts. 8 pieces with platinum inserts. 8 pieces with pink gold inserts. 8 pieces with black inserts. 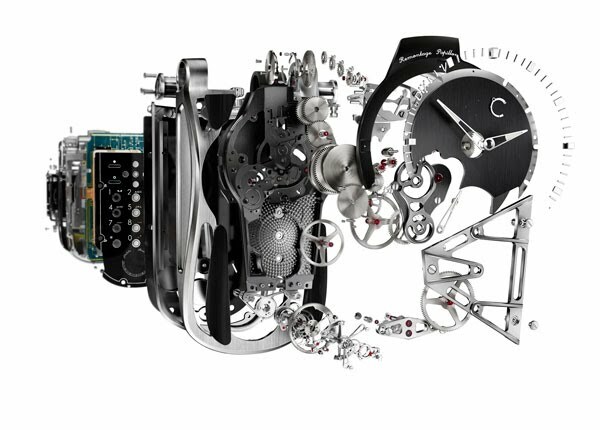 700 mechanical parts, including 330 in the watch movement alone. High-end watchmaking finishes: polishing, satin-brushing, Clous de Paris hobnail pattern, shotblasting. Patented mechanical hinge (Remontage Papillon), serving to harness and store the kinetic energy generated by the user. 100-hour power reserve. 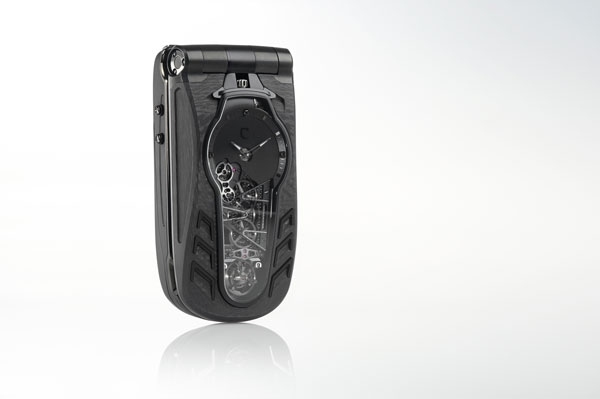 Each opening and closing of the clamshell phone generates an additional three hours of power reserve. Flying Solitaire tourbillon visible on both sides. World’s most off-centred tourbillion (36 mm). Regulating organ mounted on shock-absorbers. Movement integrated within water-resistant case in aluminium treated with GL titanium and ceramic coating to ensure extreme resistance. Platform Made in France, 2.75G GSM-GPRS-EDGE : Triband 900/1800/1900MHz . User interface deliberately simple, user friendly and designed to optimize the ergonomics. Multi-lingual interface, including: French, English, Chinese, Russian, Spanish, Arabic. Photo / Video : 3.2Mpix camera, Autofocus, Flash, Digital Zoom. “LeHolster”: Two hand-stitched leather accessories designed by Celsius X VI II and made by specialized craftsmen. “LeKit”: Mechanical Hands-Free Kit in leather and polished /satin-brushed metal. This “tie pin” accessory includes an ingenious system ensuring the wires do not tangle. “LaBase”: Docking Station in high-density resin, leather and polished and satin-brushed metal. “LaChaîne”: Chain equipped with mechanical components: belt attached with spring-mounted beads and mechanically linked to the phone.